Docs for Tots fosters connections between young children’s doctors, policymakers, early childhood practitioners, and other stakeholders. Docs for Tots take a two-pronged approach to improving children’s health and chances of success, simultaneously promoting: 1) Policy innovation: to create comprehensive systems that support children’s healthy development and 2) Practice transformation: to ensure that doctors and other professionals who work with young children have all the tools they need to allow children to thrive. When Docs for Tots came to us in 2010 they were a new organization with big plans. They saw the need to create a community of doctors who could work together to help improve healthcare access and outcomes for children. They needed a website with the ability to speak to multiple audiences which could offer content based on the audience and user. 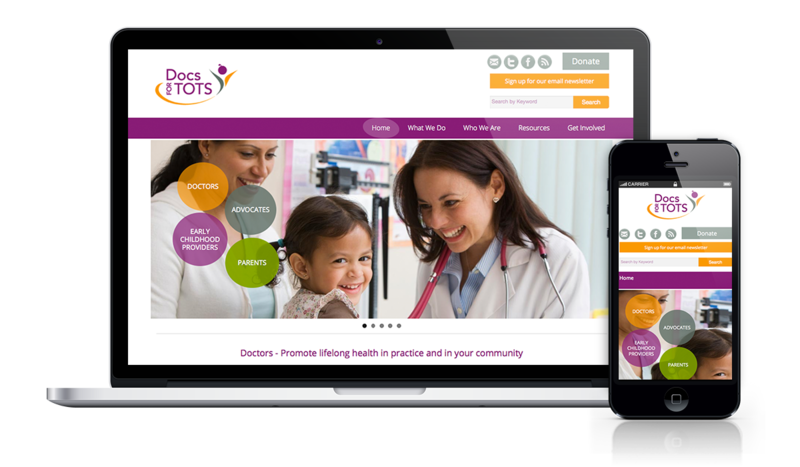 Gorilla Web Studio's solution for Docs for Tots was to create a custom WordPress deployment that involved deep customization of the blogging engine to sort content for separate audiences and custom plugins to foster user engagement, interaction, and acquisition.